Does anybody remember playing Boxes or Fences as a kid? It’s the two-player game with two different colored pens and you try to capture as many squares as you can? No? Well, it’s the kind of thing you play during math class or biology when you can get away with it, and it’s really simple. I always used to play with graph paper, but ideally you just have a grid of dots. You take turns drawing lines between the dots, eventually trying to make finished squares. It doesn’t matter which colors make up the walls, because the last person to complete a square has captured it and gets an extra turn. In terms of gameplay, it’s about half a step up from tic-tac-toe, but there is some amount of strategy involved. It’s not terribly sophisticated, but when you’re a bored kid with nothing but graph paper, you use what you’ve got, and Hemmed In aims to recreate this in app form. 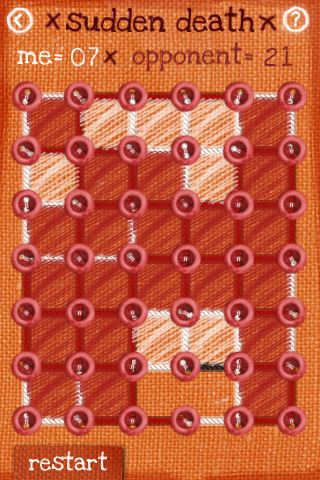 Hemmed In uses buttons for dots and thread for lines, hence the name, but the gameplay is exactly the same. You have the choice of playing against an opponent via Bluetooth or the computer. You can choose either best of three or sudden death, and with the computer there are three difficulty levels to choose from: easy, not too bad, and difficult. The design had a kind of handmade charm, all burlap and buttons, although the color scheme was a little on the blah side and not especially color-blind friendly. The interface worked well enough, with nicely smooth and intuitive controls, but it’s also not an especially complicated game. Basic as it is, there are really only a few areas I found wanting, like the lack of sound. It’s not a huge concern, but most of us have been conditioned to get some kind of feedback when we do something, whether it’s making a move or selecting a menu option, and Hemmed In’s total silence just feels weird. Because it’s such a simple game, a little background music wouldn’t have been amiss. Even better would be the option to play your own music during the game. I also would have liked pass-and-play options and the ability to make matches via WiFi, since it just seems unlikely that I will ever have many friends around with Hemmed In to make Bluetooth matches with. This is the kind of game that should work perfectly with pass-and-play. Including it seems like it would have been a trivial task, so I’m actually quite surprised the developers didn’t bother. I’d be lying if I said the game was amazing, but it’s an easy and relaxed pen and paper game translated reasonably well as an app. If you’ve got a nostalgic hankering for boring math classes or you’re looking for a super-gentle strategy game for your kids, Hemmed In is a perfectly legitimate option. AppSafari review of Hemmed In was written by Tracy Yonemoto on April 15th, 2010 and categorized under App Store, Fun, Games, Multiplayer, Strategy. Page viewed 3103 times, 2 so far today. Need help on using these apps? Please read the Help Page.